Recent Tonganoxie High grad Jenny Whitledge won her third state high jump title in Saturday, making her the school's first-ever three-time state champion. 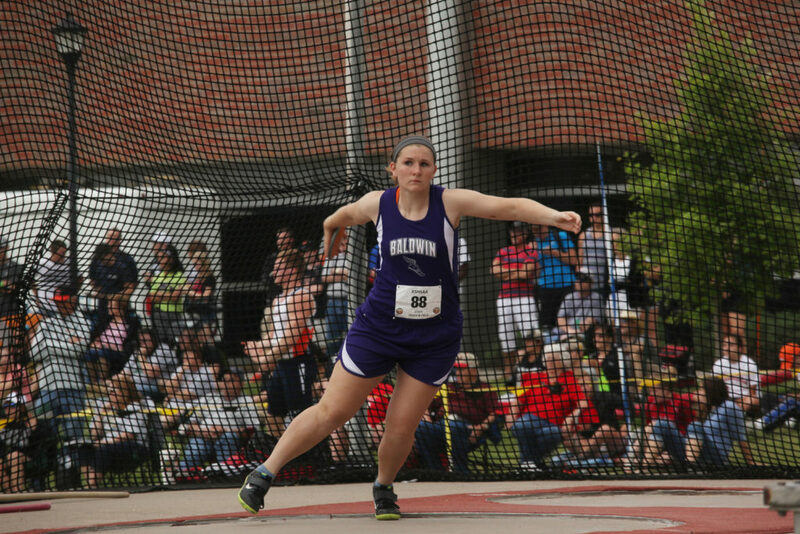 Baldwin's Katie Kehl won the Class 4A discus state championship on Friday in Wichita after a throw of 140 feet, 11 inches. 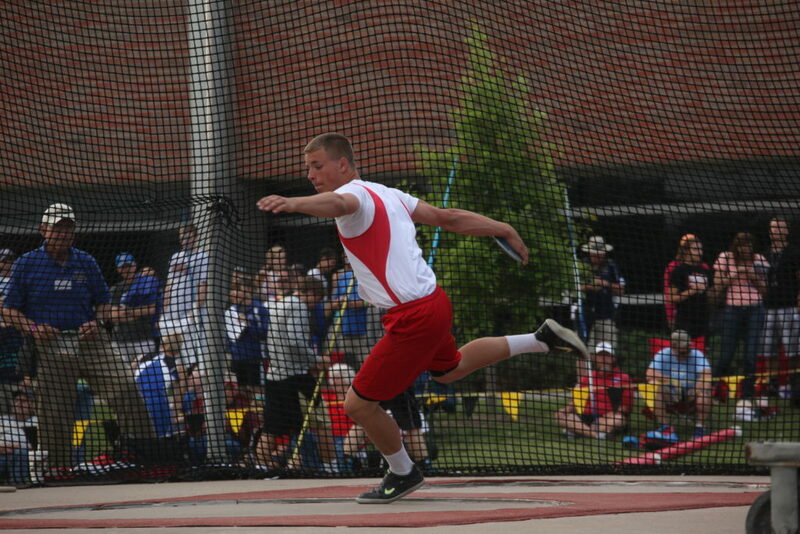 Ottawa's Kord Ferguson won the Class 4A discus championship with a 187-04 throw Friday at Cessna Stadium in Wichita. Mill Valley senior Emily Brigham reacts after setting a new 5A state track and field championship meet record with a 12-8 in the pole vault Friday in Wichita. Wichita ? 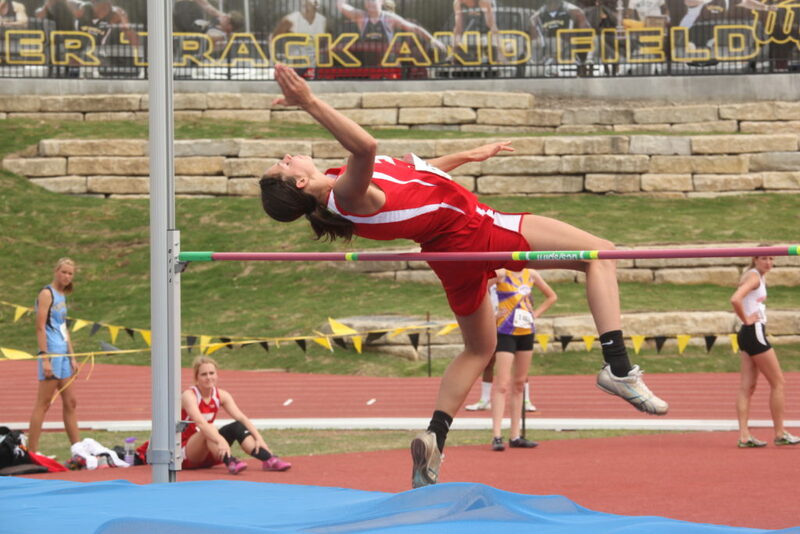 In her last two trips to state, Tonganoxie High’s Jenny Whitledge left Wichita State University with a high-jump title. The stakes reached an all-time high in her final visit to Cessna Stadium, but once again she found herself on the top step of the podium. Mere feet from her soon-to-be home, Whitledge became the Chieftains’ first three-time state champion Friday, winning the event in a jump-off with Shania Vannoster of Independence. Whitledge and Vannoster each cleared the bar at 5 feet, 6 inches, forcing a tie as the only two jumpers remaining. Both missed at 5-8, 5-7 and 5-6 in the jump-off, and Whitledge got a chance to clinch the title when Vannoster came up short at 5-5. The recent THS graduate capitalized on the opportunity, easily clearing the bar to cap the first three-peat in school history. “At first, I didn’t even realize it,” Whitledge said. “My first thought was to get off the mat in case I hit (the bar). When I looked up and saw it, I didn’t really even know what to say or think. Whitledge extended her lead as the program’s all-time point scorer. She has 770 career points — 12 more than previous record holder, 2008 grad Tracy Hileman. Whitledge’s third and final high-jump title came just outside Charles Koch Arena, where she’ll begin her Shocker volleyball career in the fall. As she has so many times in the last three years, Whitledge had a teammate by her side until her final jumps. Chieftain junior Haley Griffin took third in the event with a personal-best jump of 5-6. She joined Whitledge and Vannoster as the only three jumpers to clear that height, but finished third because she had more misses at a previous height. 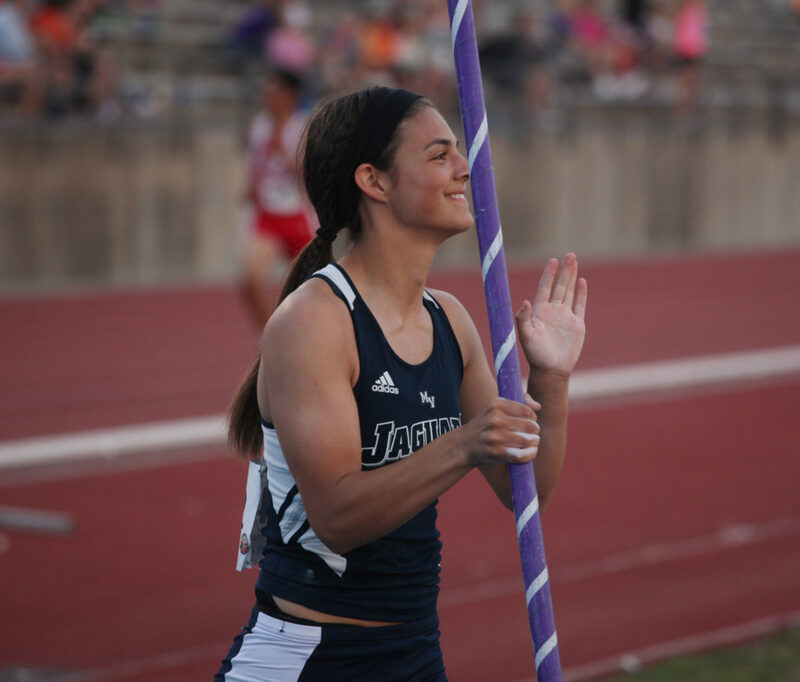 Mill Valley senior Emily Brigham won the Class 5A state pole vault championship. The University of South Dakota signee didn’t clear her last attempt at 13-3, but she still left her mark on the state-meet record book. Brigham set a meet record after clearing 12-1 and extended it to 12-8 by the end of the event. Laying claim to an all-time state record of 13-7, Brigham entered the meet confident she’d eventually find herself atop the medal stand. Once that was assured, thoughts turned to ending the previous three-way meet record. Brigham has one more event left in her high school career: today’s long jump. She won the 5A title in 2012 and enters the event with a shot at one more meet record — Brigham’s career-best 20-41?4 is beyond of the 19-103?4 mark set in 2009. Ottawa’s Kord Ferguson added a pair of titles, winning the 4A shot put (61-63?4) and discus (187-4). Partly because of a tough wind, he fell short of the 4A state records in both events (62-91?2 in shot put; 205-5 in discus). De Soto’s Angel Vasquez became a two-time state champ in the 3,200, winning in 9:41.03. Vasquez, who was shooting for the 4A record of 9:27.90, won by more than 8 seconds while overcoming a recurring twinge just above his right hamstring. Baldwin’s Katie Kehl also took gold in the 4A discus at 140-11. 100 prelims — 7. Holly Webb, 16.05; 9. Mary Altman, 16.56. 4X100 relay prelims — 12. Mill Valley (Erin Hay, Holly Webb, Whitney Hazlett, McKenzie Schmitt) 53.20. 4X400 relay prelims — 4. Mill Valley (McKenzie Schmitt, Emma Hansen, Bailey Dollard, Eleanor Wilson) 4:10.72. Javelin — 14. Emily Rice, 103-03. Triple jump — 6. Madison Estell, 35-11.50; 12. Kathy Nguyen, 33-01.00. Pole vault — 1. Emily Brigham, 12-08; 11. Mary Altman, 8-06. 110 hurdles prelims — 10. Cody Deas, 15.77. 4X100 relay prelims — 11. Mill Valley (Logan Zavodny, Daniel Rebeck, Christian Jegen, Tai Nguyen) 44.48. 400 prelims — 11. Johnathon Poorman, 52.57. 300 hurdles prelims — 14. Cody Deas, 41.33. 200 prelims — 12. Tai Nguyen, 23.59. 4X400 relay prelims — 12. Mill Valley (Johnathon Poorman, Keenan Ford, Clifford Meeks, Jason Hogard) 3:31.74. Pole vault — 7. Connor Hays, 13-00. Javelin — 8. Henry Midyett, 153-10; 10. Benjamin Carroll, 152-10. Long jump — 9. Daniel Rebeck, 21-03.50. 100 hurdles prelims — 15. Maddie Ogle, 16.94. 4X100 relay prelims — 5. Baldwin (Elena Watson, Morgan Lober, Kyna Smith, Glenn Kelley McCabe) 50.07. 400 prelims — 1. Morgan Lober, 58.56; 4. Glenn Kelley McCabe, 58.98. 300 hurdles prelims — 14. Maddie Ogle, 50.02. 200 prelims — 14. Kyna Smith, 28.06. 4X400 relay prelims — 1. Baldwin (Elena Watson, Morgan Lober, Kaitlyn Barnes, Glenn Kelley McCabe) 3:58.70. Discus — 1. Katie Kehl, 140-11; 4. Alexia Stein, 129-04. 3200 — 16. Sienna Durr, 13:36.66. 4X100 relay prelims — 11. Baldwin (Joel Halford, Chad Berg, Mark Harman, Darius Johnson) 44.57. 300 hurdles prelims — 15. Mark Harman, 42.75. 4X400 relay prelims — 4. Baldwin (Joel Halford, Chad Berg, Joe Pierce, Darius Johnson) 3:31.91. Shot put — 2. Dayton Valentine, 60-04.50. Discus — 2. Dayton Valentine, 168-08. 3200 — 4. Meredith Wolfe, 12:00.24; 14. Rebekah Burgweger, 12:40.34. 300 hurdles prelims — 13. Zachary Griffiths, 41.61. Long jump — 11. Zachary Griffiths, 19-10.75. 3200 — 1. Angel Vazquez, 9:41.03; 14. Diego Sanchez, 10:55.03. Pole vault — 6. Brent Johnson, 13-00; 10. Zachary Griffiths, 12-06; 12. Nick Taulbee, 12-00. Discus — 7. Allison Webb, 122-03; 8. Kennedy O’Dell, 118-05. 3200 — 13. Jonathan Miller, 10:55.02. 400 prelims — 12. Tyra Lyday, 1:02.57. High jump — 11. Tyra Lyday, 5-00. 400 prelims — 9. Aaron Miller, 51.48. 200 prelims — 12. Aaron Miller, 23.65. Long jump — 3. Dallas Natt, 21-10.25. Shot put — 1. Kord Ferguson, 61-06.75; 3. Cory Peoples, 52-09.50; 8. Michael Jensen, 49-00.75. Discus — 1. Kord Ferguson, 187-04; 4. Michael Jensen, 150-03. 100 hurdles prelims — 8. Anna Erickson, 16.49. 400 prelims — 13. Melissa Schmidt, 1:02.66. 300 hurdles prelims — 8. Emma Taylor, 48.62; 11. Krystal Thompson, 49.47. 4X400 relay prelims — 11. Perry-Lecompton (Melissa Schmidt, Krystal Thompson, Kaylee Visser, Emma Taylor) 4:17.04. 110 hurdles prelims — 16. Riley Davis, 16.39. 4X100 relay prelims — 6. Perry-Lecompton (Cody Williams, Riley Davis, Colin Coleman, William Hinrichsen) 44.13. 400 prelims — 4. Colin Coleman, 50.87. 300 hurdles prelims — 16. Tyler Ball, 43.19. 200 prelims — 13. Riley Davis, 23.87. 4X400 relay prelims — 1. Perry-Lecompton (Colin Coleman, Riley Davis, Seth Surface, William Hinrichsen) 3:24.53. Long jump — 9. William Hinrichsen, 20-01.25. High jump — 1. Jennifer Whitledge, 5-6; 3. Haley Griffin, 5-06. 110 hurdles prelims — 15. Ben Johnson, 16.27. 100 prelims — 16. Anna Moore, 17.66. 400 prelims — 14. Kayla Steffey, 1:06.27. 300 hurdles prelims — 14. Anna Moore, 52.30. Long jump — 11. Summer Cerny, 15-01.50. Pole vault — NH. Kayla Steffey. 200 meter prelims — 16. C.J. Kilgo, 29.06. Discus — 10. Nicole Kruse, 102-07. Long jump — 14. Justin Sharp, 18-07.